Rules encompass cue-action-outcome associations used to guide decisions and strategies in a specific context. Subregions of the frontal cortex including the orbitofrontal cortex (OFC) and dorsomedial prefrontal cortex (dmPFC) are implicated in rule learning, although changes in structural connectivity underlying rule learning are poorly understood. 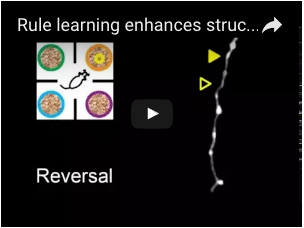 We imaged OFC axonal projections to dmPFC during training in a multiple choice foraging task and used a reinforcement learning model to quantify explore–exploit strategy use and prediction error magnitude. 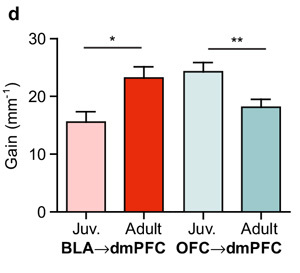 Here we show that rule training, but not experience of reward alone, enhances OFC bouton plasticity. Baseline bouton density and gains during training correlate with rule exploitation, while bouton loss correlates with exploration and scales with the magnitude of experienced prediction errors. We conclude that rule learning sculpts frontal cortex interconnectivity and adjusts a thermostat for the explore–exploit balance. Environmental stress and deprivation increase vulnerability to substance use disorders in humans and promote drug-seeking behavior in animal models. In contrast, experiences of mastery and stability may shape neural circuitry in ways that build resilience to future challenges. Cognitive training offers a potential intervention for reducing vulnerability in the face of environmental stress or deprivation. 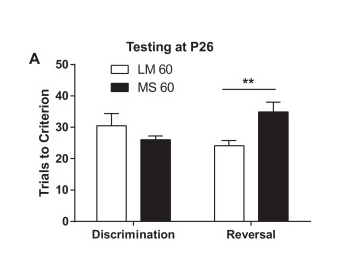 Here, we test the hypothesis that brief cognitive training can promote long-term resilience to one measure of drug-seeking behavior, cocaine conditioned place preference (CPP), in mice. In young adulthood, mice underwent cognitive training, received rewards while exploring a training arena (i.e. yoked control), or remained in their home cages. Beginning 4 weeks after cessation of training, we conditioned mice in a CPP paradigm and then tested them weekly for CPP maintenance or daily for CPP extinction. We found that a brief 9-day cognitive training protocol reduced maintenance of cocaine CPP when compared to standard housed and yoked conditions. 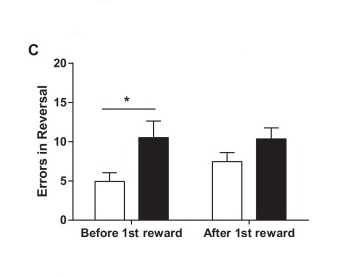 This beneficial effect persisted long after cessation of the training, as mice remained in their home cages for 4 weeks between training and cocaine exposure. When mice were tested for CPP on a daily extinction schedule, we found that all trained and yoked groups that left their home cages to receive rewards in a training arena showed significant extinction of CPP, while mice kept in standard housing for the same period did not extinguish CPP. These data suggest that in early adulthood, deprivation may confer vulnerability to drug-seeking behavior and that brief interventions may promote long-term resilience. The maturation of inhibitory circuits during adolescence may be tied to the onset of mental health disorders such as schizophrenia. 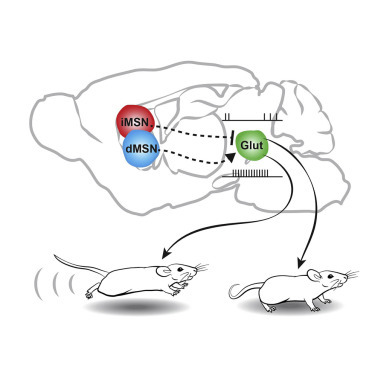 Neurotrophin signaling likely plays a critical role in supporting inhibitory circuit development and is also implicated in psychiatric disease. Within the neocortex, subcircuits may mature at different times and show differential sensitivity to neurotrophin signaling. We measured miniature inhibitory and excitatory postsynaptic currents (mIPSCs and mEPSCs) in Layer 5 cell-types in the mouse anterior cingulate (Cg) across the periadolescent period. We differentiated cell-types mainly by Thy1 YFP transgene expression and also retrobead injection labeling in the contralateral Cg and ipsilateral pons. We found that YFP− neurons and commissural projecting neurons had lower frequency of mIPSCs than neighboring YFP+ neurons or pons projecting neurons in juvenile mice (P21–25). 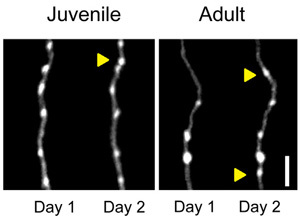 YFP− neurons and to a lesser extent commissural projecting neurons also showed a significant increase in mIPSC amplitude during the periadolescent period (P21–25 vs. P40–50), which was not seen in YFP+ neurons or pons projecting neurons. Systemic disruption of tyrosine kinase receptor B (TrkB) signaling during P23–50 in TrkBF616A mice blocked developmental changes in mIPSC amplitude, without affecting miniature excitatory post synaptic currents (mEPSCs). Our data suggest that the maturation of inhibitory inputs onto Layer 5 pyramidal neurons is cell-type specific. These data may inform our understanding of adolescent brain development across species and aid in identifying candidate subcircuits that may show greater vulnerability in mental illness. Decision making can be defined as the flexible integration and transformation of information from the external world into action. Recently, the development of novel genetic tools and new behavioral paradigms has made it attractive to study behavior of all kinds in rodents. By some perspectives, rodents are not an acceptable model for the study of decision making due to their simpler behavior often attributed to their less extensive cortical development when compared to non-human primates. We argue that decision making can be approached with a common framework across species. We review insights from comparative anatomy that suggest the expansion of cortical-striatal connectivity is a key development in evolutionary increases in behavioral flexibility. We briefly review studies that establish a role for corticostriatal circuits in integrative decision making. Finally, we provide an overview of a few recent, highly complementary rodent decision making studies using genetic tools, revealing with new cellular and tempo- ral resolution how, when and where information can be integrated and compared in striatal circuits to influence choice.